Garlic pods -- 10 to 15 nos. Onion -- chopped -- 1/2 no. Fenugreek seeds -- 4 nos. First roast the items given one by one and let it cool. Grind all these ingredients to a fine smooth paste adding sufficient water. Soak the tamarind in hot water and squeeze out the juice. Mix the ground paste in the tamarind juice and add turmeric powder and salt. Mix everything together and keep it ready. Take a karahi and do the seasoning. first add the 2 tbsp of sesame oil and heat it. Add the mustard seeds and pop it.Add the urad dal and channa dal and fry until it turns slightly golden brown, followed by fenugreek seeds and curry leaves.Now add the garlic pods and saute well for 3 minutes in the oil. Now add the tamarind mixture into this seasoning and mix well. Add a cup of water .Cover and cook this mixture until u get rid of the raw smell and that will take probably 5 to 7 minutes. Later add the jaggery and mix well. Finally add the remaining 2 tbsp of sesame oil and let it boil for 3 more minutes and switch off. U may omit the fenugreek seeds while grinding if u r against it. This kulambu is made acc to my family needs ,i mean, as per taste. U can modify to suit ur taste. 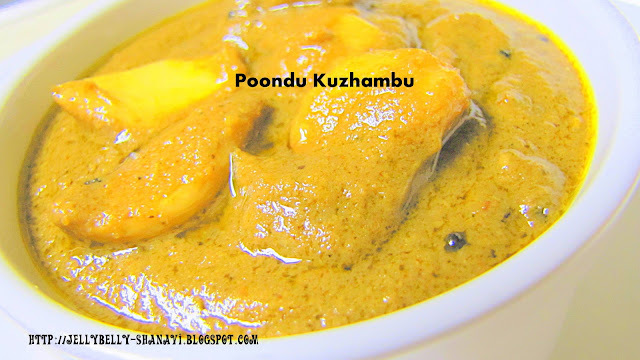 Adding jaggery is also optional,but trust me, it just enhances the flavour of this kulambu..
OMg, my fav, havent had since a long, delicious kuzhambu..
Gravy looks so delicious,must have tasted great. That curry looks so spicy, delicious and yumm!!! Bookmarked to try it, thanks for sharing, moms are surely angels. I love anything garlicky n this sounds heavenly to me :)..great pic n great recipe !!!! this looks so good shanavi--loved the colour ! Look very yummy and flavorful Shanavi. Kozhambu looks awesome. Great looking curry. Wow!!!! me too a big fan of garlic..curry looks awesome..
thank u for dropping dear!! garlic curry looks yummmy and tempting! !perfect with rice...im also glad to follow u dear! the kulambu looks very tasty with the thick yummy gravy. Love garlic so this is definitely one for me.